and with a whopping almost 40 degree here today.. EVERYTHING IS MELTING.. no complaints here!! It was next to nothing outside when I put this guy together. I like him alot. My punch characters help push the creativity when I cannot get 'inky'... that will only make sense to someone who is a stamper! Ha ha. 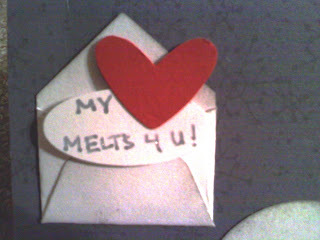 The envelope was tricky as was getting the right angle of the heart to use as the tab. I love it. So fun! 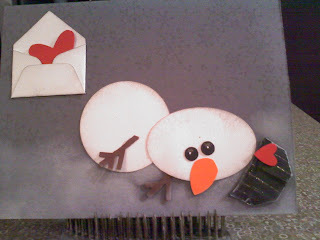 Thanks for posting your blog on Stampin' Connection.